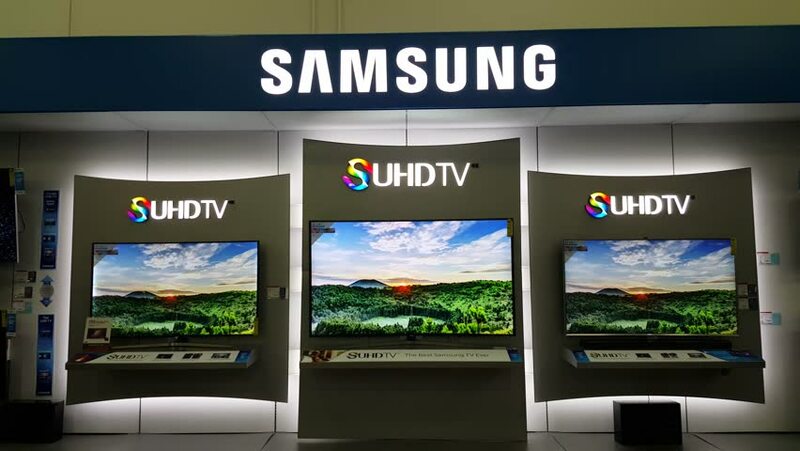 MOUNTAIN VIEW, CA/USA - JANUARY 24: Samsung UHD TV at Best Buy store in Mountain View, CA on Jan 24, 2016. It is the highest resolution TV in the market. hd00:15Bangkok, Thailand – April 27, 2014: Exterior view of a Samsung shop in the Siam Square area of Bangkok, Thailand. People can be seen inside the store. hd00:12HONG KONG, CHINA - CIRCA JUNE 2014: Adidas store, Tsim Sha Tsui district. Adidas corporation exists since 1924 and had EUR 14.5bn revenue in 2012. 4k00:20SHENZHEN, CHINA - CIRCA NOVEMBER 2018 : Store with HUAWEI LOGO and APPLE LOGO in HUAQIANGBEI area.